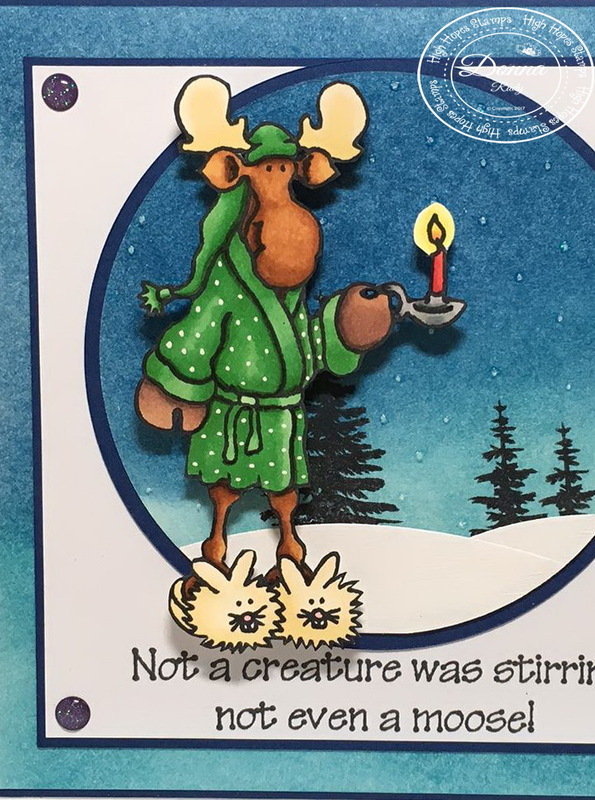 I'm getting a lot of my Christmas cards done and I just wanted to share with you another cutie! 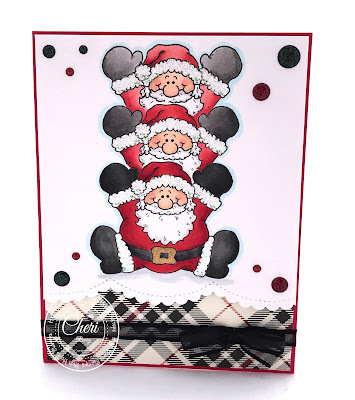 This is "Large Stackable Santa" from High Hopes Stamps! As soon as I heard the title of this stamp. I knew that I had to actually make the image "stacked". I started with the base "Stackable Santa" and then masked him off with a post-it note. 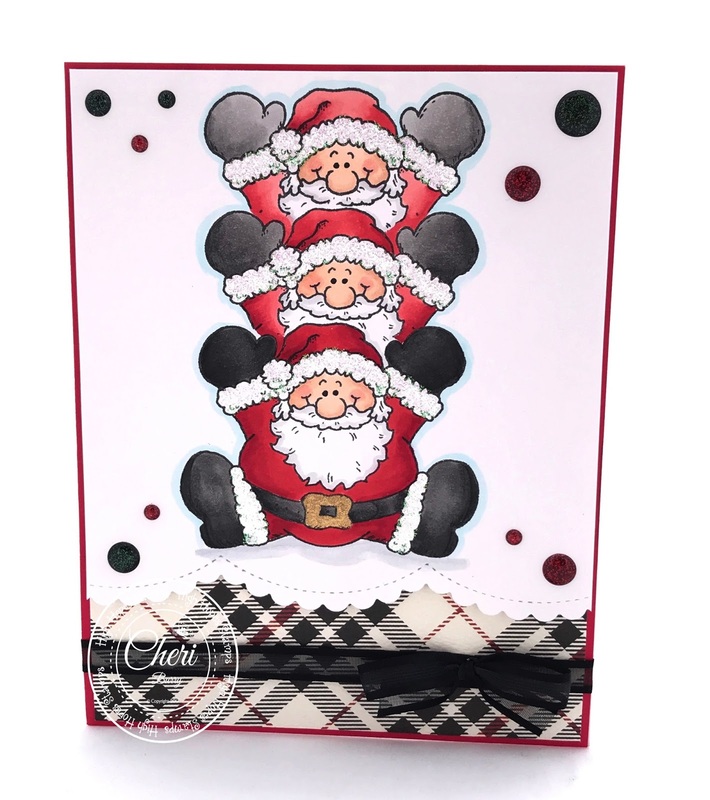 I stamped the middle Santa and then using the same process stamped the 3rd Santa. 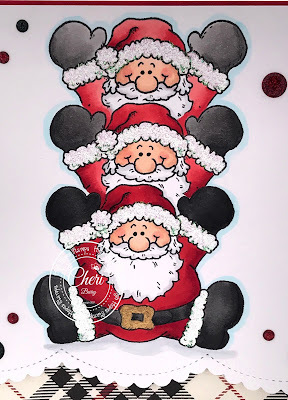 Now I have a cute pile of "Large Stackable Santas"! I started colouring the bottom Santa and then as I went up I adjusted my colours to create a bit of a "ombré" effect. 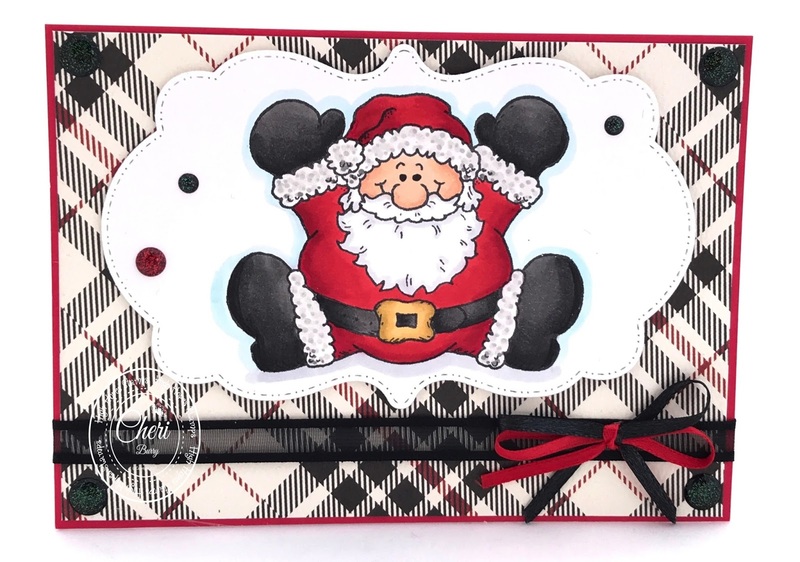 Of course I also had to make just a "one" Santa card too as He's just too adorable! back to another Monday card inspiration. 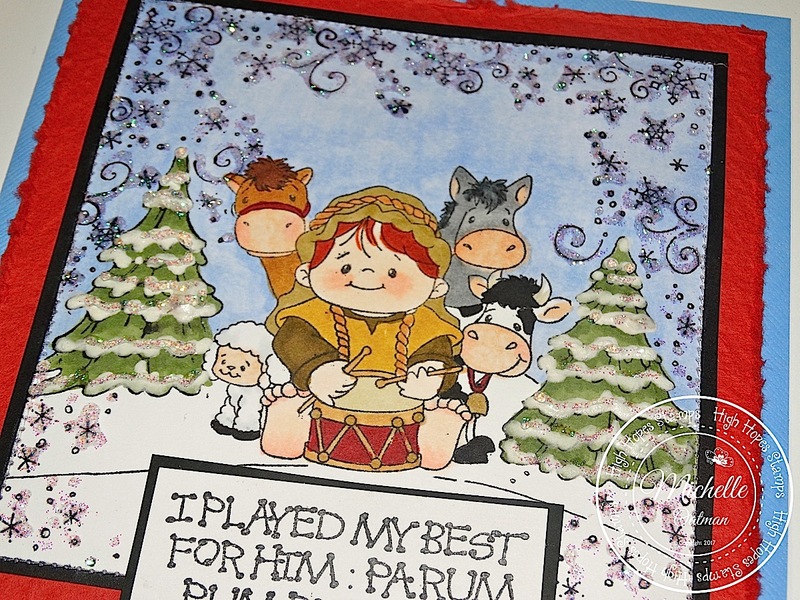 I stamped image with Memento Tuxedo black ink and colored with alcohol markers. Fussy cut it and used foam adhesive to pop it. 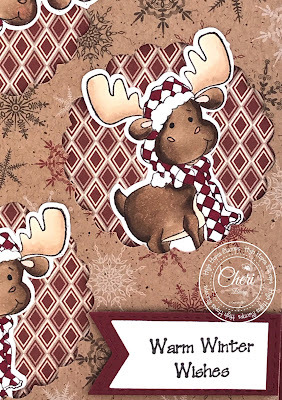 The pattern paper is *Milk&Cookies from doodlebug design. I'm using *wild wasabi seam binding ribbon a couple mini bells and a button I purchased last year. To finish I used a few 4mm sparkling sequins, mini pom-pom on her hat and a white gel pen. There is a New High Hopes Challenge this month! Click Here to go to the Challenge and see the rules and link up your card! 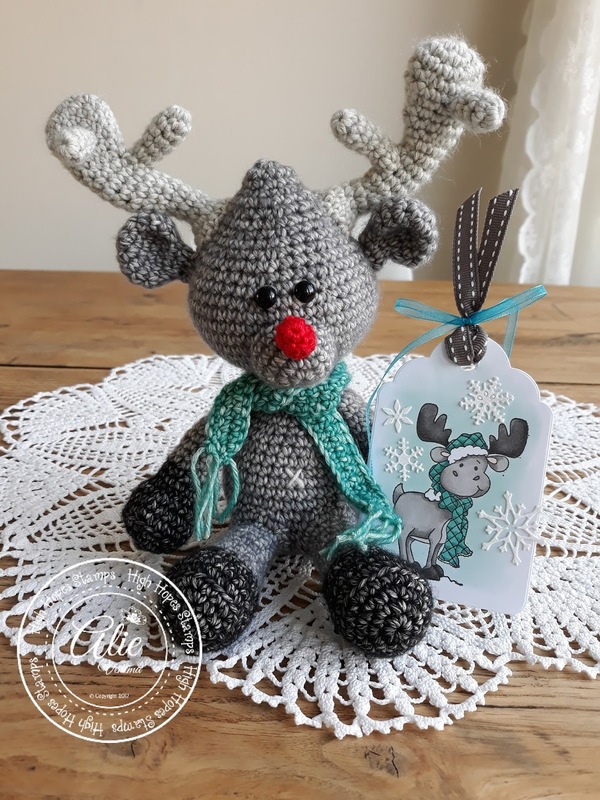 This cute little Moose has been shown a lot already, but it is a real cutie so who's to blaim right? I know you'd like to have this stamp too!! 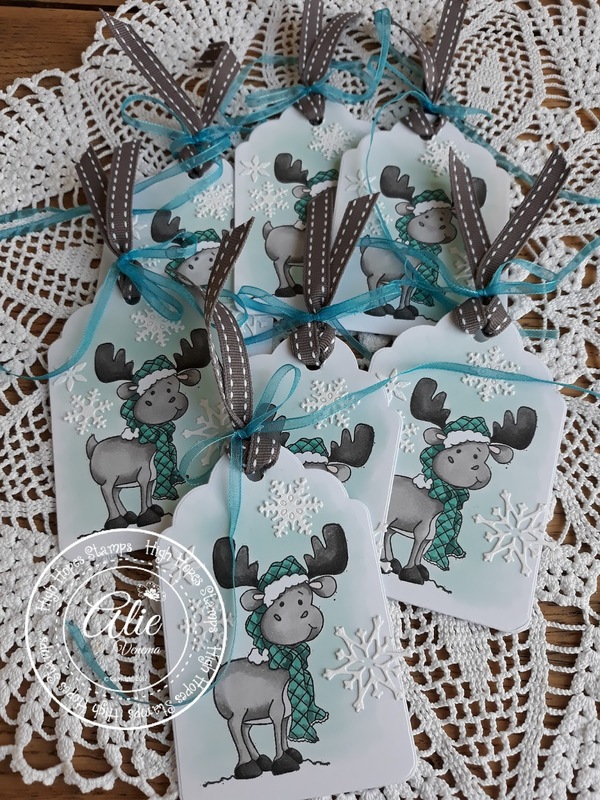 I made some gift tags with Winter Moose to go with the chrocheted Reindeer Christmas gifts.. 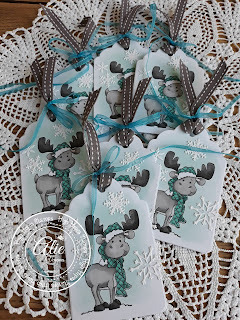 I also added some ribbons matching the colours of the tags.. (from my HUGE stash of ribbons, I still need to find a better way to storage them, haha)..
Well, I know you like this Winter Moose... so if you are interested in winning some High Hopes Stamps, just hop on over to our Challenge Post to find out how you could win 2 free stamps of your choice!! Whoop Whoop!! Thanks for stopping by! 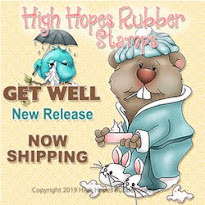 If you'd like to see more stamps, you can find them at the High Hopes Stamps website HERE..
and folds nicely to put in the mail. was coloured with Copic Markers and the snowy hills were embossed and hand cut! 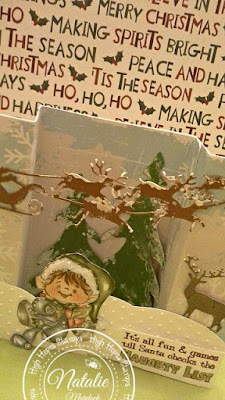 Santa and the reindeer are die cut images and I also made them snowy too! Remember Santa's watching and he knows when your good! I hope you'd like to join us in our Christmas/Winter Challenge, you can find all the details HERE. Happy Friday High Hopes Fans!!! 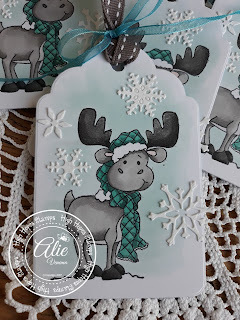 Today I am sharing a wintery card that I created using Polar Sleigh from High Hopes Stamps. The patterned paper is Echo Park's "The Story of Christmas" 6x6 pad. 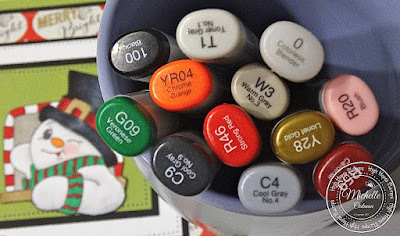 I colored the image with Prisma colored pencils (dark green, cardinal red, black, orange, silver, chocolate) I blended the pencil with gamsol and blending stumps. 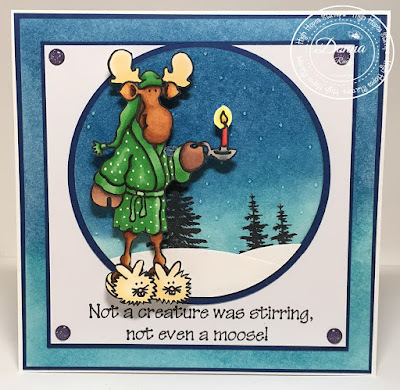 I die cut the image with Fitted Frames dies from Stampendous. The sentiment is Peace Love Joy. Hope you enjoyed my winter inspiration! of stamps, glitter, cardstock, patterned paper and bling - how bout you? This week I would like to introduce you to Stirrin' Milton. After choosing my sentiment I had the Twas the night before Christmas poem going through my head so I decided that I would do a peaceful winter night ink blended background for Milton.......he is in his fuzzy bunny slippers after all! 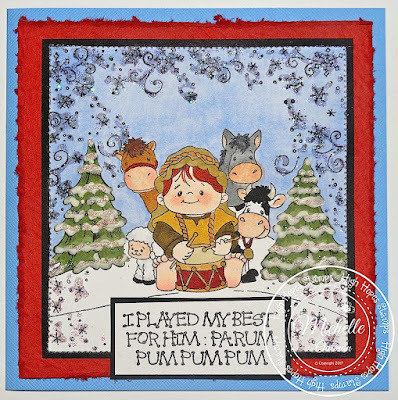 I stamped Milton, coloured him with alcohol markers and hand fussy cut him using cuticle scissors. 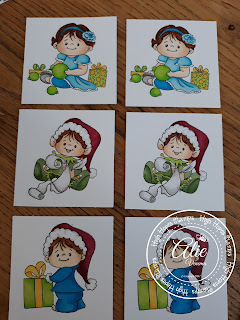 Some navy blue cardstock and glitter gumdrops finish off this simple card layout. Howdy - MichelleO here today having some fun with a cute little friend. How can you not love a cute little snowman winking at you? 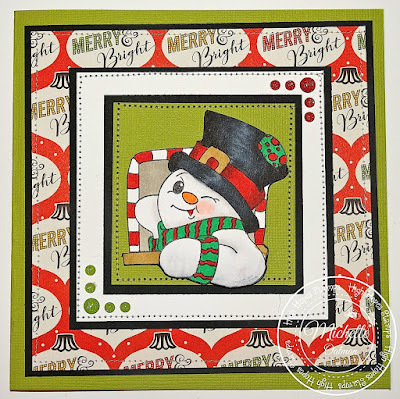 This is High Hopes Stamps "Winking Snowman" he is so handsome. This guy just makes me grin. What is he winking about? He is just having some fun. 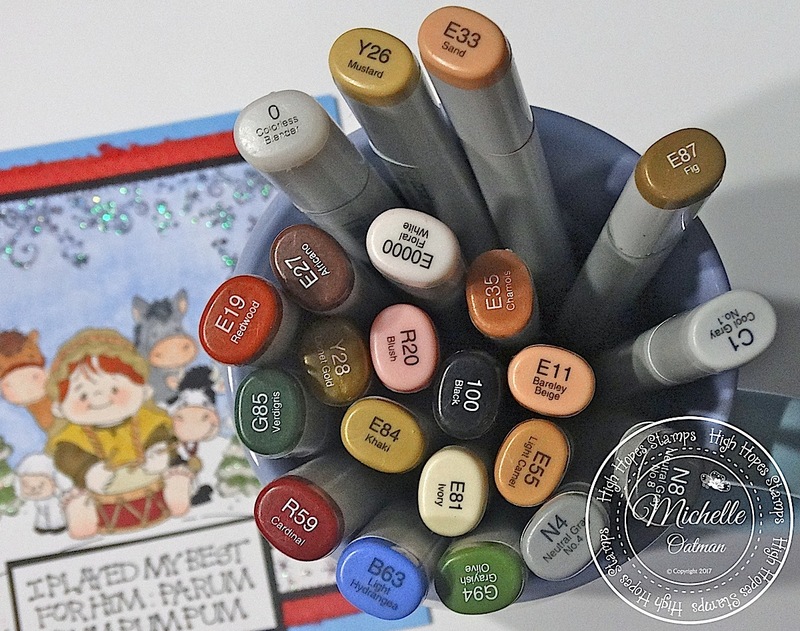 I colored with my Copics (colors below) and then found a scrap sheet of Christmas paper that I love the vintage feel of. 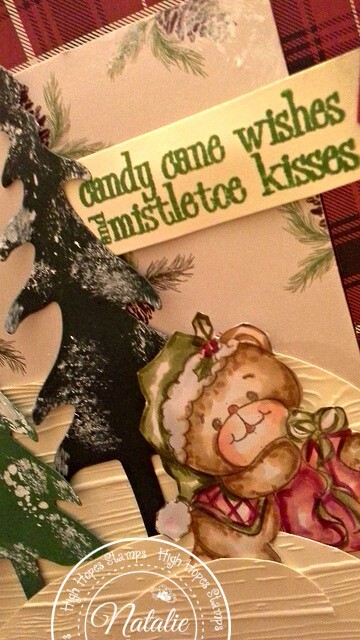 I matched it up with a little non traditional brighter color green, white and black card stock. All the layers are sewn down and then I added a few sparkling enamel dots for embellishment. 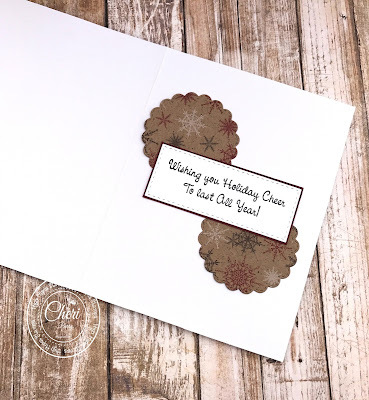 A simple card but fun little holiday card. 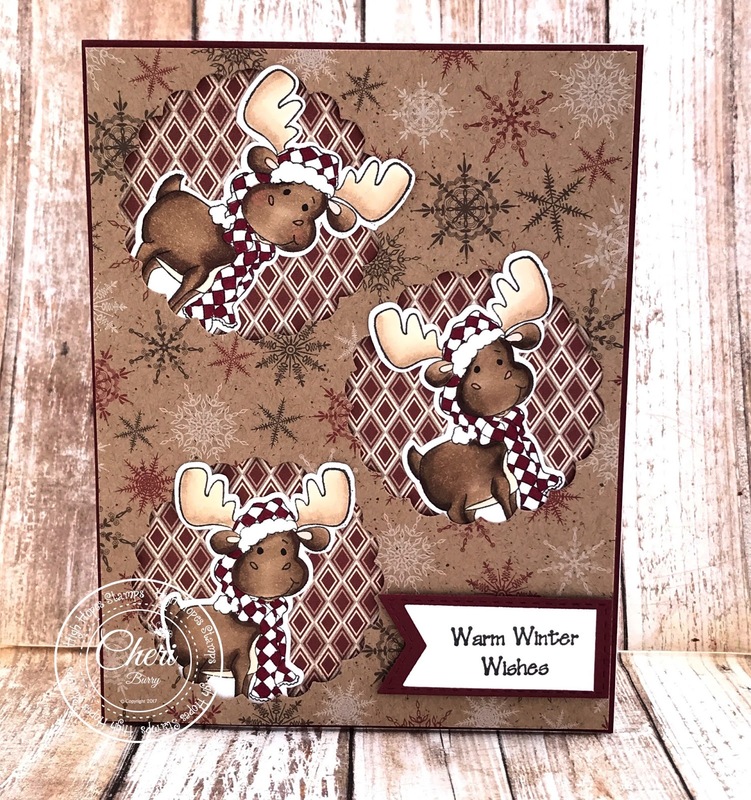 Meet the adorable "Winter Moose" from the latest Release over at High Hopes Stamps called "Season of Celebration". He's just super cute and perfect for your Fall or Winter theme cards! I stamped then coloured my images with my Copic Markers and then fussy cut them out using my Brother Cut N Scan machine. I decided I wanted "Winter Moose" To be peeking out of different scalloped circles, so I made 3 of him. I cut my paper with the scallop circles and then added a designed paper to coordinate behind the cut out piece. 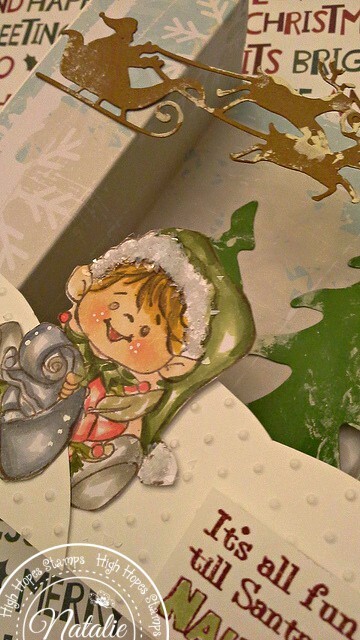 I popped those layers up with foam tape and adhered them to my card base. 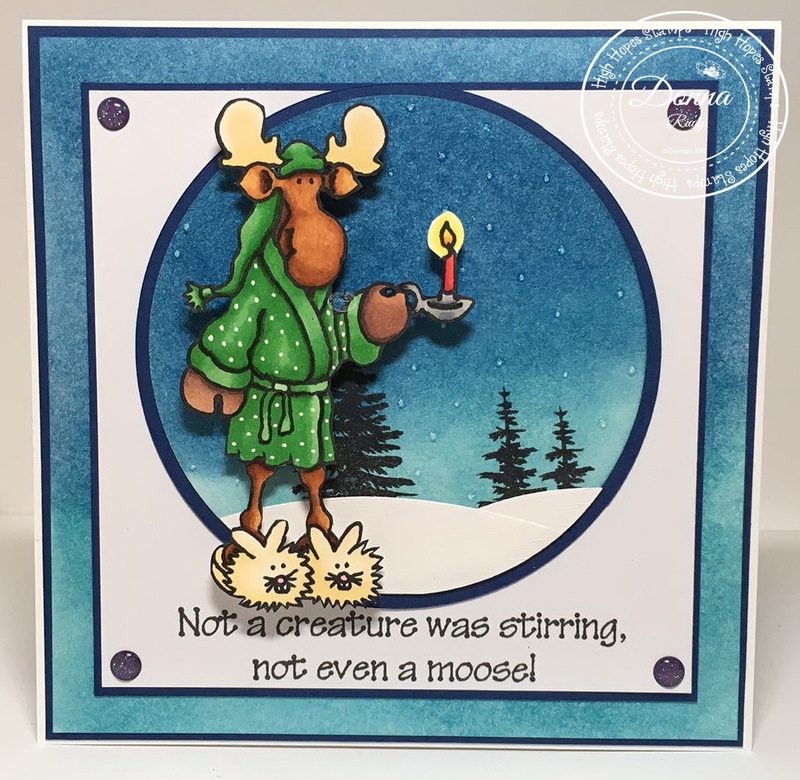 Next I just slipped "Winter Moose" into various positions within the circles and glued him down. The sentiment is also from HH and is called "Dot Warm Winter Wishes"
On the inside I used the sentiment called "Holiday All Year". 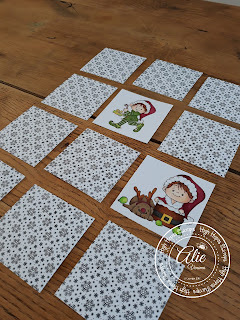 Don't forget to join us over on the HH Blog in our "Christmas/ Winter Fun" Challenge! 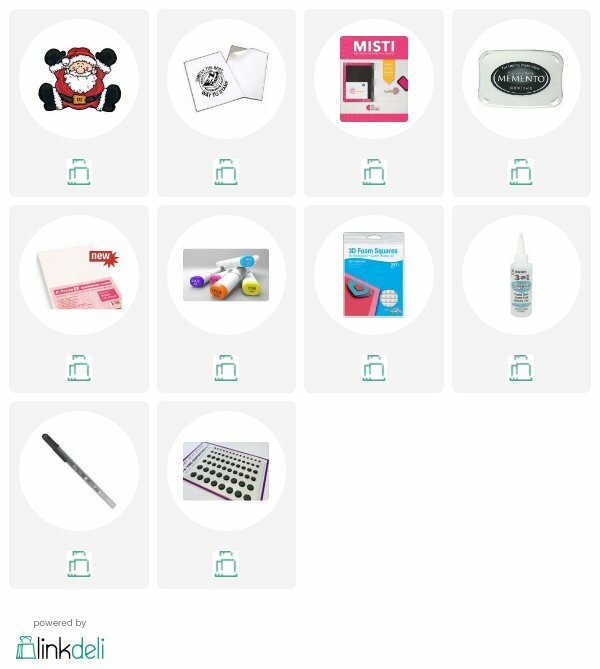 You could win 2 free High Hopes Stamps!! I stamped my image with Memento tuxedo ink and used alcohol markers. 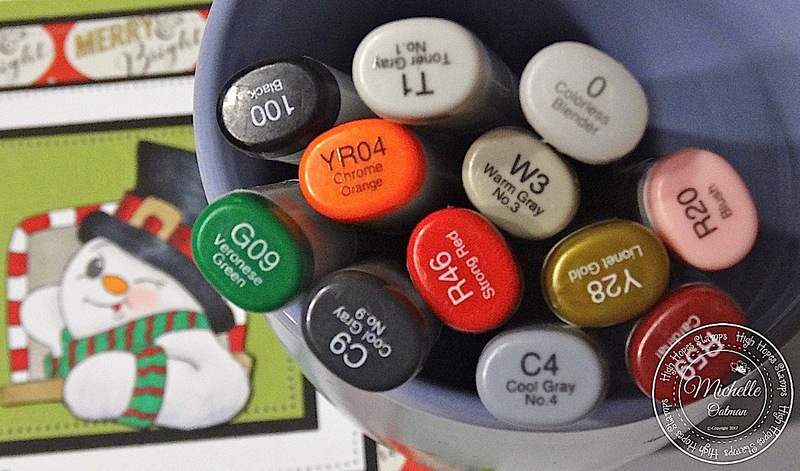 Copic List; R27 R29 R39 E00 E31 E33 E37 E51 YR07. After the image was all done I fussy cut it and used 3D foam adhesive. All the pattern paper are scrap from my stash. I also add some Nuvo crystal drop and sequins to embellish the tag. For finishing touches I used one of my favorite sentiment "For My Teacher" and added. Hope this Christmas project have inspired you today. 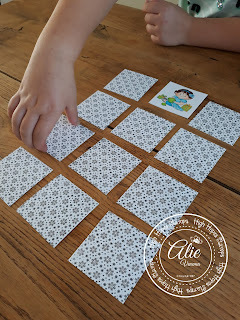 For today I made a little memory game I can play with my kids! It is really simple to make, but it will take some time to colour all the images.. 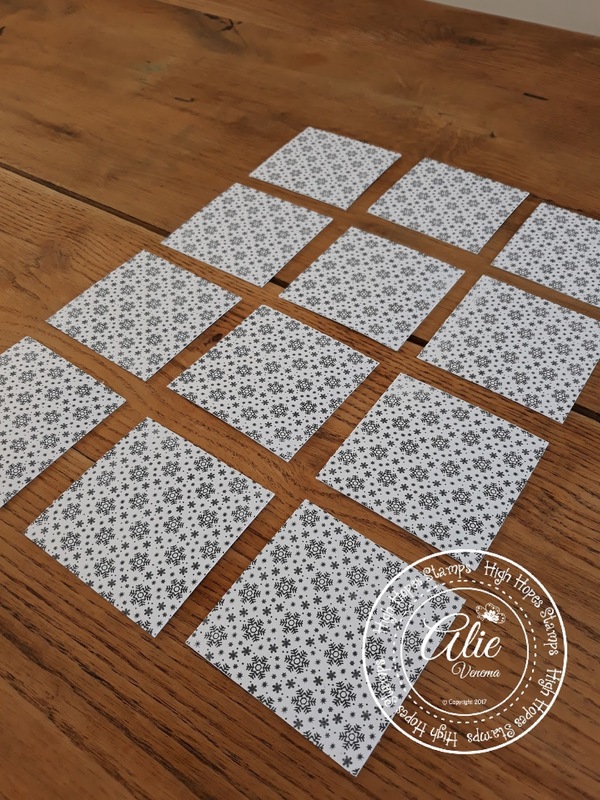 So first step is to cut little squares (7 cm x 7 cm). Take as many as you'd like. I made a small memory with 6 images, so I needed 12 squares for the images and 12 squares for the background. For the background I've used the Snowflake background. Because I coloured the images with my Copic Markers, the ink is visible on the back of the paper. 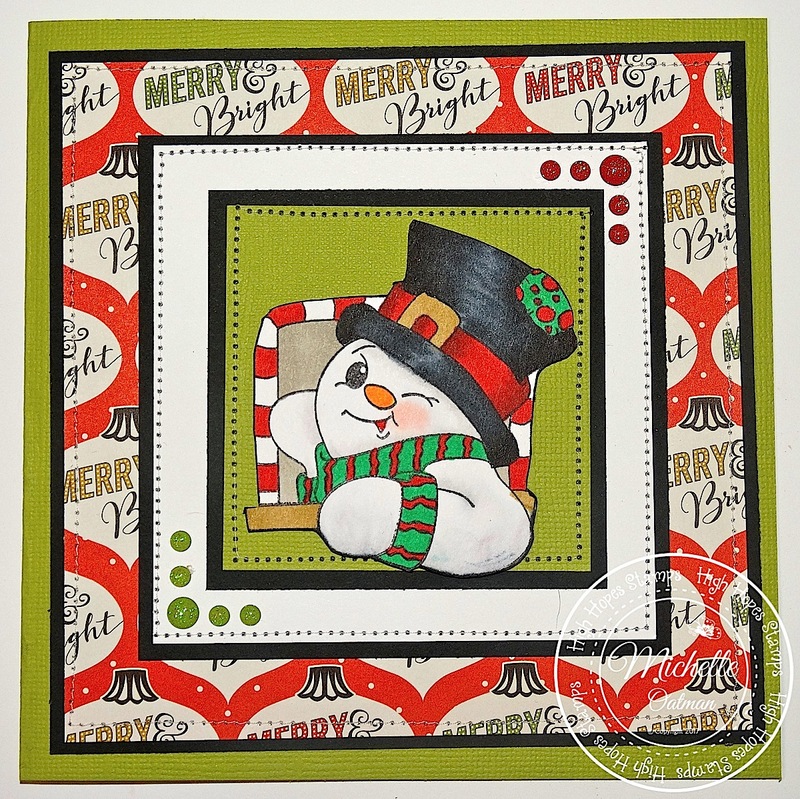 So cut out another 12 squares and stamp the snowflake background on those squares. Glue them together. I hope you like this idea! It is also a fun Christmas gift! A little bit of Copic Colouring, fussy cutting and embossed cream coloured snowy hills. 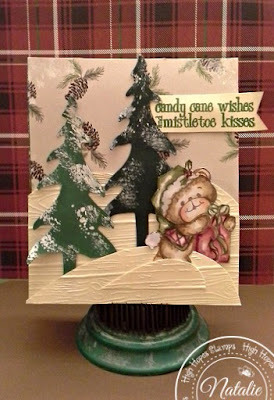 The trees are lightly dusted with white acrylic paint and a fun pine cone pattern paper was used on the background. Kristine here with another paper pieced project for you! High Hopes Stamps just scream out for paper piecing and it's so fun and easy to do! Check out this Paper Piecing Tutorial I did a few years ago! The image is Christmas Baby Boy. The colored portions were colored with Prisma colored pencils. I used Tulip puffy paint on the white cuffs and fluffy part of the hat. 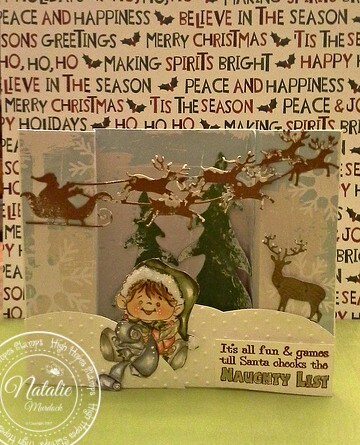 The paper is a Christmas pad from Hobby Lobby by The Paper Studio. The Ribbon is a scrap of Memory Makers I had in my stash. The Circle dies are Spellbinder classic Circles. I fussy cut out the image and adhered it to the card with 3D foam. 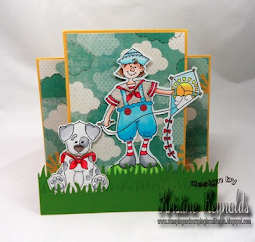 I am so happy with how this card turned out and I hope you love it too! Welcome back High Hopes fans! My post this week features Harp Angel from the new Seasons of Celebration Release. I have chosen to colour her in some non traditional Christmas colours. 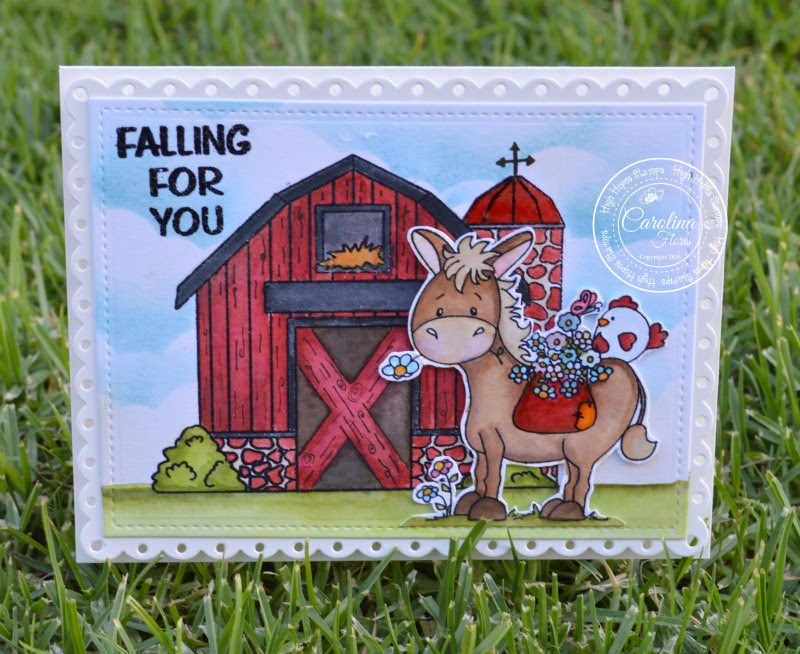 This stamp is versatile as I can see using it being used for Valentines' Day too...hmmm....another card added to my "to do" list . 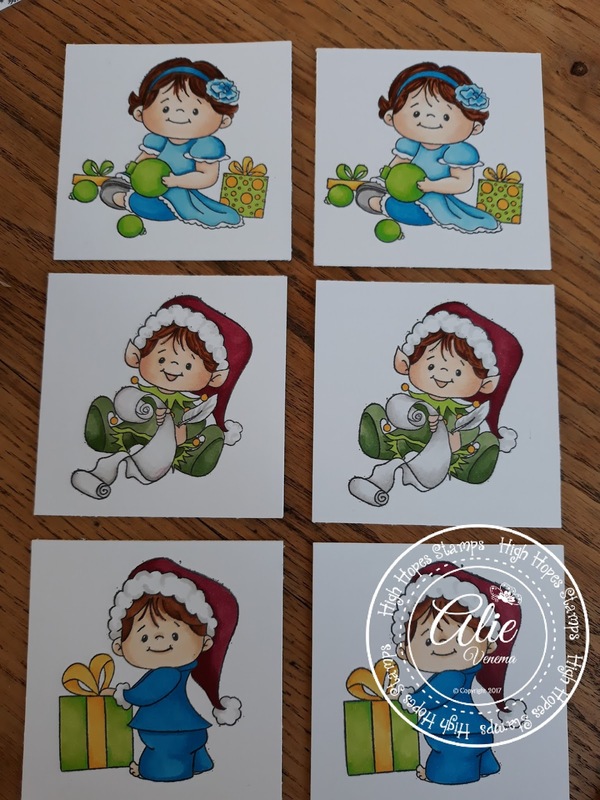 My Mom's best friend loves angels on her Christmas cards so I can see an "order" coming up for this stamp especially because my Mom was with me when I coloured it and said the stamp would be perfect for her bestie! After colouring this sweetie with alcohol markers I cut her out using a stitched square die. 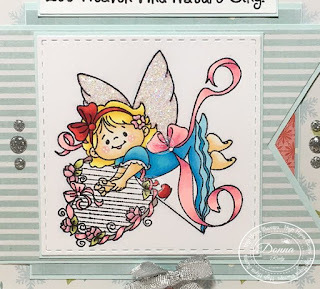 I added some Stickles to her wings and silver sparkle pen to her harp - I love a bit of bling on my cards! 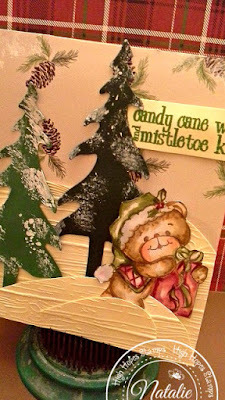 Some paper from MME was perfect for my non traditional colours and a simple silver bow and some silver gumdrops finish off my card. 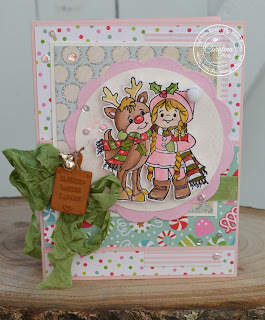 Howdy - MichelleO here today and if you are wondering if you remember this image from last weeks High Hopes Stamps post. Well Sort of... 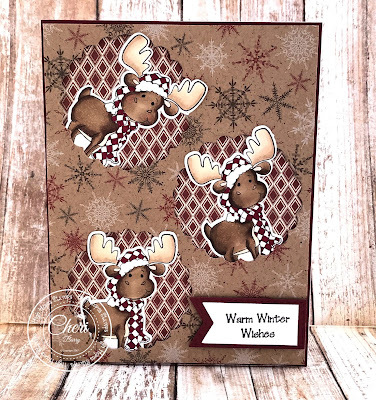 I pulled out the new release Little Drummer Boy & Friends to play with this week I still had the Winter Wonderland Background on my desk from my card last week. 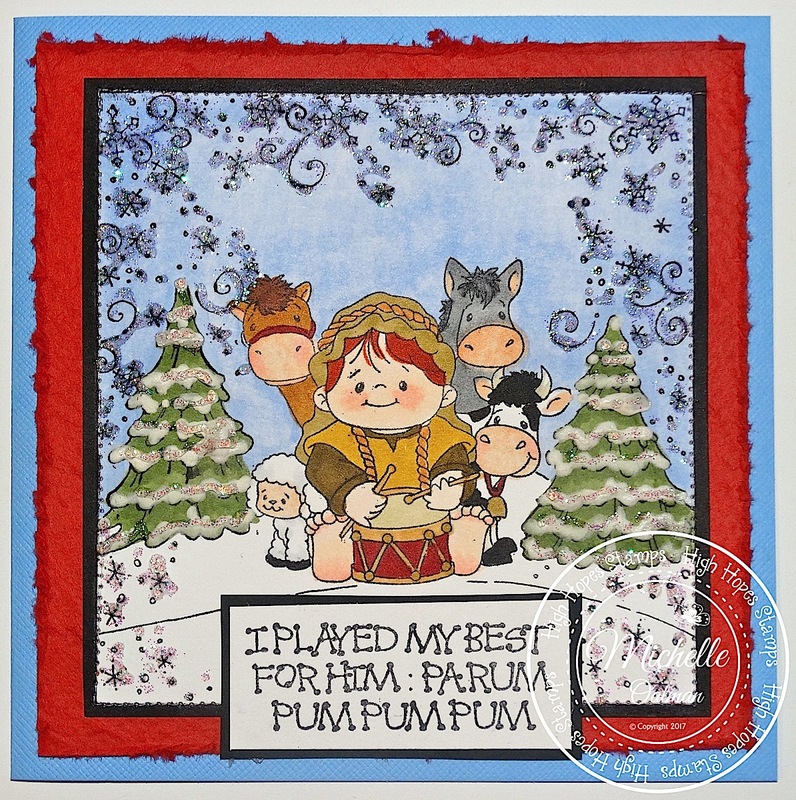 I sat the Drummer boy on the background image just by accident... and then had to stamp them together! 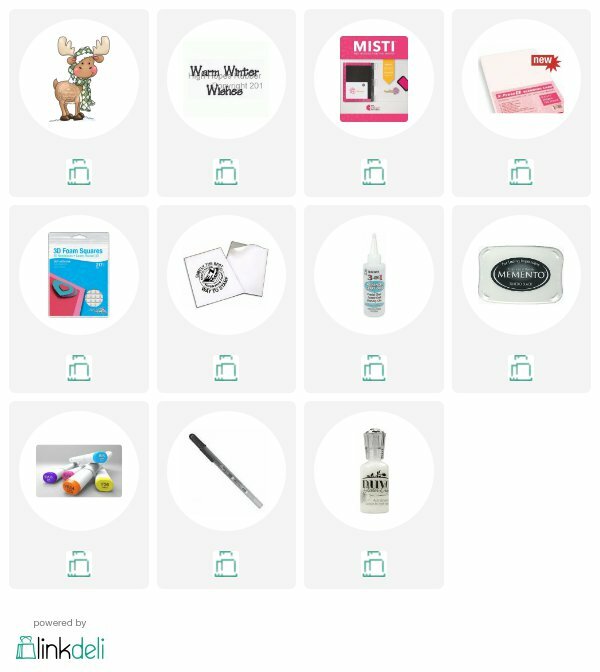 That background stamp is a favorite and it works wonderfully with so many images! Cute right?? I colored with my Copics (colors below) after masking off the drummer and friends then stamping the background over him. I had lots of fun again with my Marvy Snow Marker and then LOTS of Viva Decor Glitter Pen. For my card I went with simple colors light blue for my base, Fiber paper that I frayed on the edges and then the black is actually where I went around the edges with a black copic. A fun older sentiment worked well with this stamp. Here is an angled photo to show off all that bling snow! 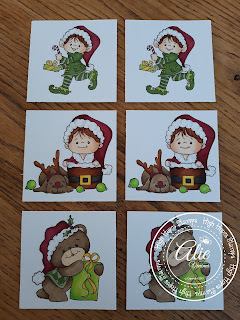 Imagine a whole collection of different Christmas Cards all with different images centered!! Oh.. ideas brewing! Christmas Boy & Reindeer Dog!